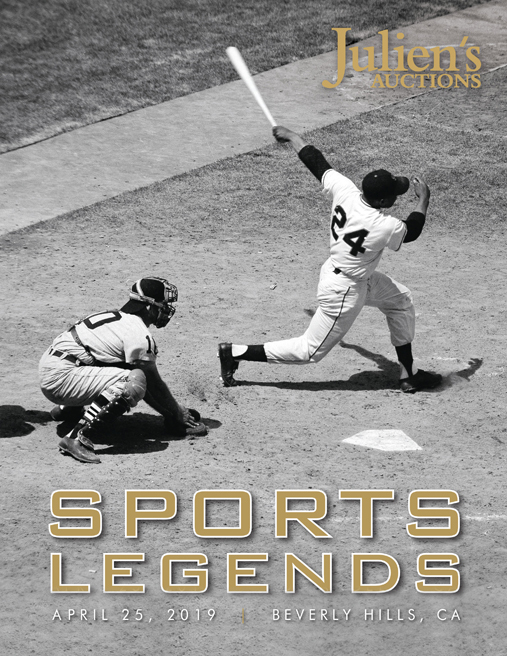 Join Julien’s Auctions on Thursday, April 25th in Los Angeles and live online at www.juliensauctions.com as we present memorabilia from the Sports Legends Auction. With an incredible offering of property from the biggest names in sports spanning the globe, this collection will inspire sports fans as property from the greatest legends and legendary events are brought to market. Julien’s Auctions is thrilled to present a selection of incredible property including a pair of gold medals - The 2002 FIFA World Cup Winners Medal (estimate: $40,000 - $60,000) as well as the 1930 FIFA World Cup Gold Winners Medal (estimate $30,000 - $40,000). Julien’s is excited to highlight legends of the past as well as emerging legends in-the-making. From a game/training-worn full uniform belonging to “The Say Hey Kid” himself Willie Mays (est. $40,000 - $50,000) to match-worn boots from the teenage boy wonder of the French National team Kylian Mbappé (estimate: $6,000 - $10,000), the collection boasts an impressive range of property from icons past and present.